Prime Minister Narendra Modi launches Setu Bharatam Project in New Delhi today. The project aims to make all national highways free of railway crossings by 2019. 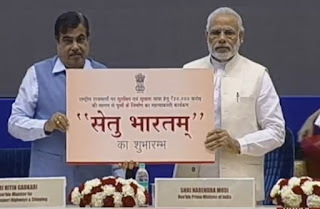 The government's 10,200 crore rupees Setu Bharatam project, which aims to make all national highways free of railway crossings by 2019. Apart from Setu Bharatam project, the government will soon start work on overhauling of British-era bridges and construction of road overbridges and underpasses at unmanned railway crossings.